Imagine living on the open prairie a few hundred years ago, the Rocky Mountains rising in the west, the Missouri River sweeping eastward. Bison gather by the tens of thousands to feast on the seasonal grasses. Your family, members of the Plains First Peoples, are here to celebrate and hunt. 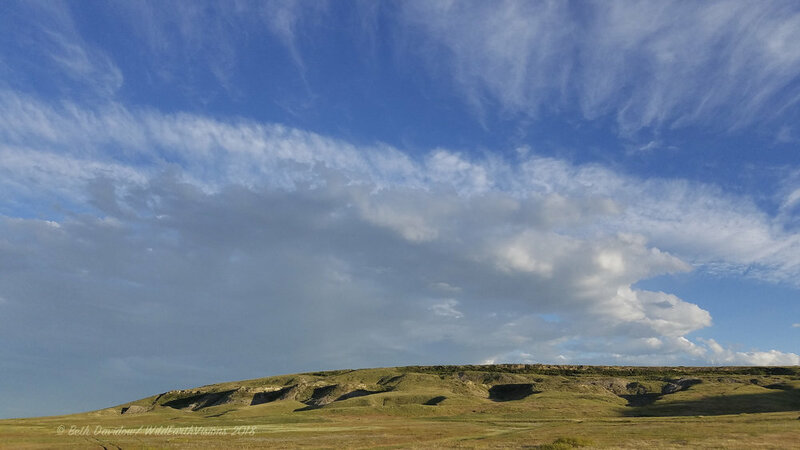 The back side of the buffalo jump. Imagine bison flowing up and over these hills! You're standing atop a mile long cliff that swells gently from the west as a grassy rise but plunges precipitously on its eastern side as an unseen cliff. You feel the ground tremble, see a cloud of dust roiling in the western sky, and suddenly a racing river of bison (buffalo) rushes past you. Leaping up, you wave a hide or blanket in the air, speeding up the panicked herd, funneling them to the precipice. With their short-sightedness and fear, the bison run at full speed to the edge, a final stride taking them over the cliff to the levels below. The momentum of the herd shoves them over the edge. Sitting atop the cliff over which buffalo plummeted to their deaths, feeding the Peoples both literally, and spiritually, securing their interconnectedness to the natural world. Below, hunters with bows & spears finish off the bison that were not killed in the fall. You, and your people, now have plenty of food to see you through the long months ahead. Your celebration & thanksgiving lasts long into the night. For some 12,000 years, people and animals lived and died here. 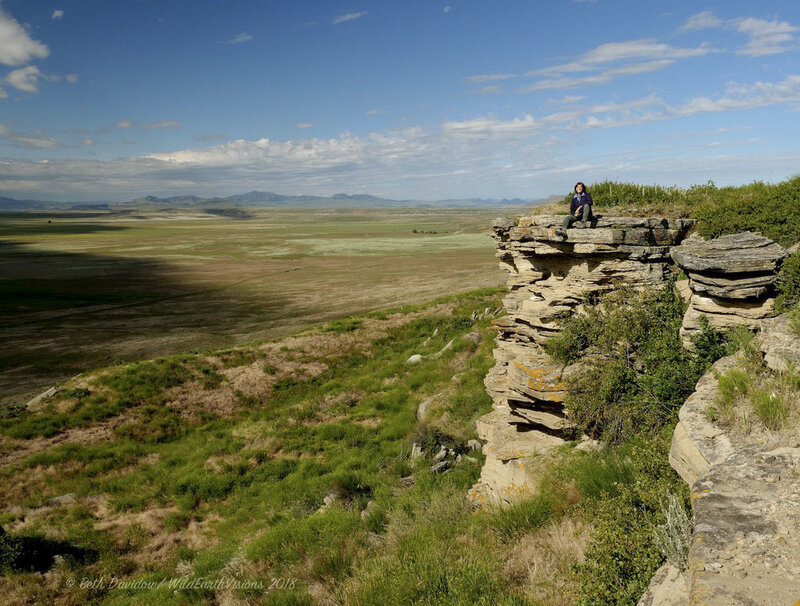 Today, this buffalo jump reminds us of the close ties people had with the land and how they integrated their lives and culture with the natural world. The Gwich'in People of the Arctic still relies on wildlife, especially caribou, for their cultural, spiritual, and food ties to the land. Caribou are their life. It is not truly possible to separate them, and to do so would be unconscionable. Being here, I can truly understand. Colorful lichens and flowers along the clifftop. Being here, I can sense this deep connection that goes beyond simply that of gathering food to survive. It is a strongly spiritual one. A female harrier wheeling overhead calls out, reminding me that this a sacred space. More than a week without Internet, and I managed to survive! The hardest part of it all was not being able to immediately share all of the incredible sights right away. Yellowstone National Park, where I just spent a week, is truly one of our Nation's greatest treasures. Ken Burns called our parks "America's Best Idea," and - as a former Park Ranger - I wholeheartedly agree! Because it is such an amazing, wonderful, magical, special place, I'll save the next post to talk more about Yellowstone and share some of the photos & adventures from the park. Right now, to answer your questions about it, I want to share with you some photos of my tiny home - the Lance Lite 825 camper. That's the fridge on the left. There's a closet on the right, and the door to the bathroom. The camper is 7 feet wide so it doesn't stick out too far beyond the side of the truck, making it easy to carry - and to see around! Inside, it seems quite spacious! The view from the bedroom, which is located in the cabover (forward) part of the camper is airy & open. There's a queen-sized bed that's too big for me and the 4 stuffed critters, Tigger, Taiga (the moose), Wiley (the black-footed ferret), and Griffen (the brush-tailed possum)! Plenty of overhead storage for clothes, a case for my natural history books alongside, and other stuff. My friend Bobbi helped me make the curtains and I love my aubergine-colored bamboo sheets! Before the addition of all the stuffed animals :-)! 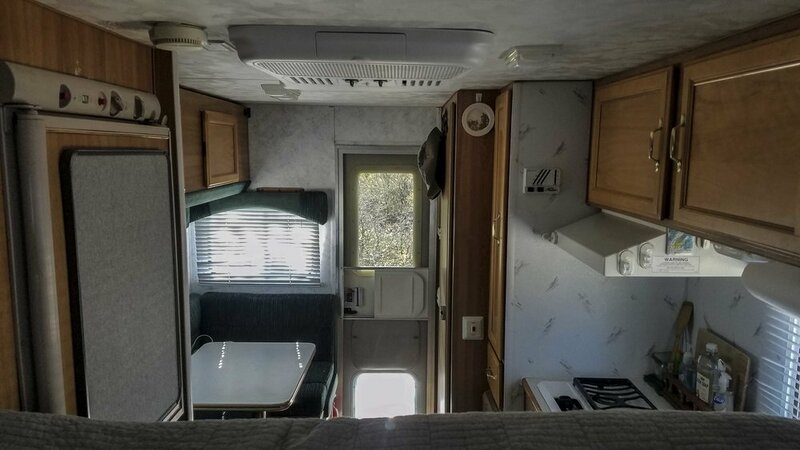 There's a cozy kitchen on the left (driver's) side of the unit. There's storage over the sink & stove for spices & coffee (both are must-haves! ), dishes, and a microwave. As long as I'm plugged into power, I can use the microwave. If there's no power, I use propane for cooking and to run the fridge (the fridge is opposite the sink). The microwave & storage above the sink & stove. My girlfriend, Nina, gifted me that cute towel I hung as a backsplash. Unless I'm on a really rough road, the knives stay in place on their magnets. The camper has a large water storage container, so I've plenty for all my cooking & cleaning needs. Over the settee (which converts into a bed) is more storage. And at the rear of the camper is a bathroom! I wasn't sure I'd care about it but I confess it is nice to have a separate room in which to wash up. It makes it feel more like a home. There's a shower I can attach to the sink, as well as a shower outside. My tiny home is cozy & compact and has everything I need to work on the road. This week, when I crawled into soft sheets under a cozy blanket after a full day I fell asleep quickly, windows open to let the deliciously cold Yellowstone air pull me into dreamland. I'm going to have a hard time for the next post choosing from all the photos I took with both my Lumix and phone! I've never hauled a camper like this before and there's a bit of a learning curve! I'm finding that my years of driving tour buses on the Denali National Park road is coming in handy! With all that weight and height on board, the truck handles differently. But, like a turtle carrying its home on its back, the truck is made for the job and does it wonderfully. The F-250 truck has the payload and power to haul the 1,800-pound camper, plus the extra hundreds of pounds in fluids (gas, water, propane), all my stuff, and me. I needed something comfy, too, for those times when Mom, and/ or Uncle, or Tom, or other friends & family join me on a road trip. This camper is made by Lance. It's a 2001 825 Lite EC (for extended cab). To safely carry it on the truck bed, I needed to have the proper mounting system installed. Seth (from whom I purchased the camper) recommended Joe Bruns, of Joe's Truck & Trailer Supply in Springfield, Oregon, as the guy to do that. Joe was great to work with! He helped me out months in advance with advice and ordering all the parts ahead of time, and ensuring it was all done neatly and quickly once we dropped the truck off at his shop. After doing my research, and with input from Joe, I chose Torklift Talons and Torklift Fast Gun turnbuckles, hardware that locks the camper down solid onto the frame of the truck, eliminating swaying, sliding, and any other movement. I've got locks on these expensive pieces to ensure they are not stolen! It is so spacious inside! The part that extends over the roof of the truck has a queen-sized bed, plus quite a bit of storage. In the kitchen are a 3-way fridge (electric, 12V, and propane), a counter with a 2 burner propane stove & sink, overhead cabinets, a closet near the counter, and cabinets below the sink. I hope I'll remember where I put everything! Opposite the kitchen is a U-shaped dinette that is comfortable and makes into a bed. I'll be sitting there a lot writing, editing, and putting this project together. More cabinets run the length of the roof above the dinette, with storage below the seating, too. There's even a bathroom! 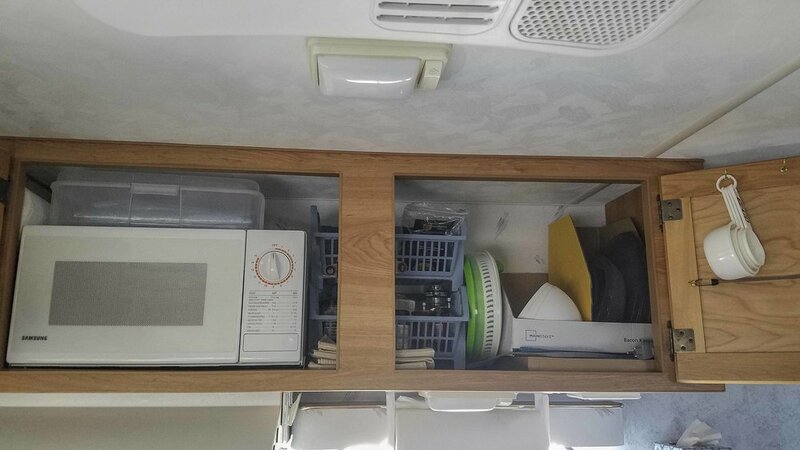 A flush toilet, sink, and shower are tucked into the space on the left rear of the camper. I was OK with a porta potty, but a real bathroom is appreciated by family! One of my concerns is being cool enough. I'm not good in heat and I really don't want to be plugged into power all the time, like at an RV park. There's an air conditioner in the roof that, when I'm plugged in, will keep the rig cool. I've scheduled an appointment with a local RV shop to install a Maxxair Fan in the camper roof. I was thinking of doing some redecorating but have decided to save money (for gas, which Tuktu loves to drink in copius amounts!). This summer will be the camper's shakedown cruise, and that will allow me to decide what needs to be done. In the coming weeks, I'll do some work on the interior and figure out where everything will live. In the summer of 2017, I borrowed a cool RoadTrek from friends and drove 11,000 miles to Alaska. Now, I'm embarking on new road trip adventures in my F-250 Ford truck and Lance cabover camper. Once upon a time, I had a little brown Ford Ranger with a canopy over the truck bed. His name was JohnWayne. I made a little bed on a cot in the back, had my camp stove & stuff organized within, and room for my camera & ferrets. Yes, I traveled with pet ferrets; that's another tale. For years, in between graduate school semesters, I drove between Texas and National Parks where I worked as a summer seasonal ranger. I made 5 or 6 trips up the Alaska Highway, and drove across country a couple of times, photographing along the way. I loved JohnWayne! I always wanted another truck and now, with WildEarthVisions, it was time to get a vehicle that could take me around the country to do my work. Day & night I pored over websites, specs, and Craigslist ads from around the country. I created spreadsheets comparing pros and cons. I barely slept. Everytime Tom asked me "what are you thinking?" I'd answer "payload" or "engine specs," or "storage measurements," or some such thing. I thought of nothing else! Late one night, while poring over truck ads, I found the perfect truck, on a website for a dealership only a couple of hours away from home. I bookmarked it. But all the decent campers I could find were just way out of my budget. Then, on a whim, I decided once more to peek at Craigslist ads up in Oregon (we go there to check on the restoration of Tom's classic FJ43 Toyota Land Cruiser). Lo, and behold! Someone had the perfect camper for sale! That clinched the decision-making for me...a larger truck it would be! Via WhatsApp, I arranged for the purchase of the camper. Over email, and a circuitous UPS shipment of paperwork (and some funny things in between), I bought the 2017 F-250 Super Crew 4x4. Wow! This thing is ginormous! After loving our electric Tesla Model X (and being concerned about & cognizant of my footprint), the thought of putting heaps of petrol into this monster is actually the scariest part of my new venture! But, it'll be a super comfy space with plenty of room for stuff and family. It's roomy enough to be home away from home, a mobile edit suite, and transportation into those quiet, wilder spaces to reconnect to Nature. Most importantly, it has the right specifications to safely handle the load of a cabover camper. I gotta give a big shout-out of thanks to Gordon & Angela at Truck Camper Magazine; the many articles in that online publication are terrific resources for understanding the ins-and-outs of truck camping. In two weeks we depart New Zealand. We land nearly 24 hours after departing (but on the same day we left) in Phoenix where we'll pick up the new truck! Because it's brown paint is called "caribou," and I love observing those migratory Arctic creatures, the new truck will be named "Tuktu," the Inuit word for caribou. Now that the adventure of choosing the truck and camper is complete, I'm looking forward to the next stage: taking Tuktu on the road in search of WildEarthVisions! Packing, especially for a long trip, is always a crazy time! I've got to account for every cable, battery, piece & part. It feels really strange to be leaving my beloved RED Dragon 6K camera at home, but for this trip and WildEarthVisions video profiles, I'll be using my Lumix GH5. Even without the RED, it's taken a number of days to ensure I have every little part and the dining area became the staging ground. In addition to the usual camera gear, including a couple of GoPro Hero 5's, I've got my Syrp motion controllers; a Wildtronics parabola for recording field audio (such a cool piece of kit! ), and audio kit to record interviews. With so many electronic pieces of equipment requiring charging - and all with different cables! - I need a way to charge on the road. I'm excited to use my new RIVER, a portable charging system by EcoFlow Tech. I'll be able to charge the unit while driving and then use its battery to charge laptops, drone & camera batteries, and all of our Smartphones & iPads. I've packed, and repacked, a few times to make sure everything will fit in the RoadTrek. I've got list after list to make sure each item is present & accounted for. I also need to bring a couple of large hard cases because I'll be flying to Nome, Alaska, to spend 10 days hoping to film muskox. And then, there's all the personal gear - I don't dare leave the hairdryer & flattening iron behind! 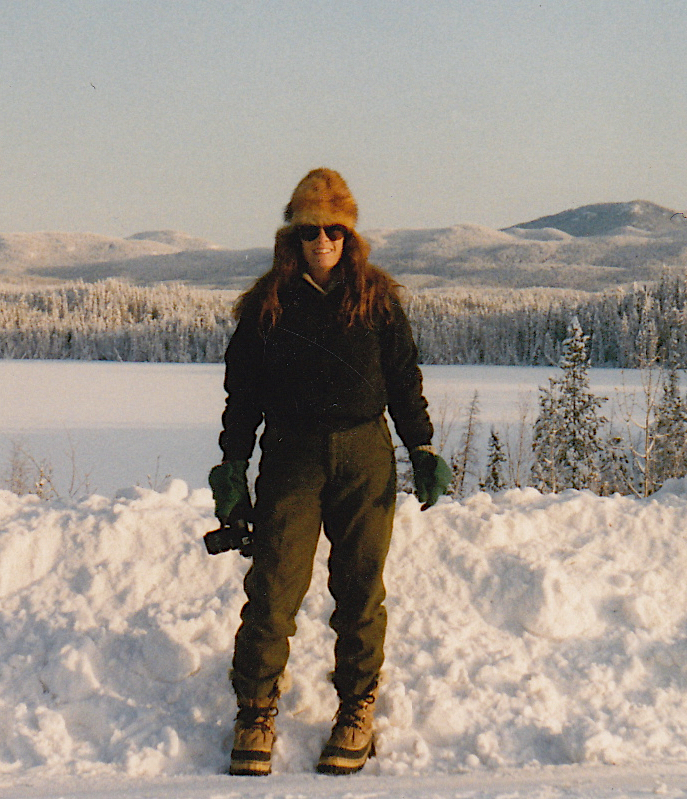 In 1996, after 6 years working there, I left Alaska. I'd been working as a Park Ranger, then a natural history guide, driving the tour buses at Denali National Park. Like many other women in oft-told tales, I met someone and decided to move with them to Montana. After my stint at Denali finished that season, I packed up and headed south, away from Alaska, or "Outside," as Alaskans call the rest of the US. On my way out of Alaska, I sat at the Yukon border, in my little Ford Ranger, watching a spectacular moon rise in a purple sky over the vast forest, lakes, and hills of the wilderness. And I cried. Something inside me knew that leaving Alaska was not the best decision. But, I wasn't listening to my inner voice. During subsequent summers, while working as a naturalist on small ships, I spent many months exploring Southeast Alaska's Inside Passage. I love the region's forested mossy-green islands where black & brown bears wander rocky shores. I love the ever-changing blue ocean alive with myriad forms of marine life. Crystal-blue glaciers, flowing cracked & crevassed from jagged mountain peaks, cascade into the sea, carving the landscape into wondrous sights. Every time I returned to Southeast, I felt like I'd come home. Something in my very spirit feels right when I'm in Alaska. But, I never made it back to the Interior. I yearned for the wide open expanses of tundra-covered hills where nearly every day I watched grizzlies, caribou, wolves, Dall sheep, moose, and other wild creatures go about their daily lives. How I missed the wide-open expanses rolling, rising, and reaching to the snow-capped peaks of the highest mountains in North America! Every year I promised would be the one in which I'd return...but I allowed the minutiae of life to block my going. Twenty years later, I had to make it happen. I couldn't go another year without seeing Denali. One day, while visiting with friends, I casually mentioned my plans to get back to Alaska. I was, at the time, looking to buy a used RoadTrek van, one like my parents had for many years. My friends said, "we have a RoadTrek, and you're welcome to borrow it!" For 2 months and many thousands of miles? "Sure," they said, "It'll be good for it to be used!" Suddenly, with my internal road blocks done, and a vehicle at the offering, things fell into place. My Mom (who'd driven to Alaska with me before) and her brother, my Uncle David (who'd never been to Interior Alaska), joined me for the journey North. Together, in our comfy home-on-wheels RoadTrek, we drove from our homes in the US, through Canada, and up to the official start of the Alaska Highway. Finally! I was nearing my beloved Alaska! I could feel my spirit lifting like an imprisoned creature leaving my chest cavity & soaring free. Join me (and Mom and Uncle) as we make that journey North and explore (20 years after I'd last been on it) one of the greatest road trips in North America. You'll be glad you made the trip!